AGNI is the Hindu noun for “fire.” By definition, thermal power plants utilize highly combustible materials as fuel. The possibility of ignition during the transport of these materials via conveyor belt is a constant threat. 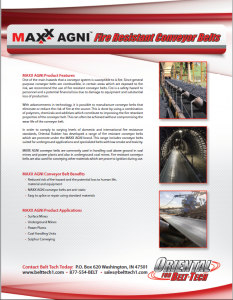 MAXX AGNI conveyor belts are specially formulated to resist ignition and to limit fire propagation in applications such as conveying coal over ground in thermal power plants. MAXX AGNI belts are available in varying formulations—flame resistant, low burning rate, low smoke and toxicity, heat and/or oil resistant, abrasion resistant, and more. Anti-static MAXX AGNI conveyor belts offer the most comprehensive range of fire resistant belts in the industry, reducing the risk of fire hazard and the potential loss to human life, materials, and installations. For more information on MAXX AGNI conveyor belts, Contact Us.